To say that I am a Charlie girl would be an understatement. It is the only perfume I have worn for since the first bottle I bought over 30 years ago. To be specific, I am a Charlie Blue girl. I have tried the Silver and although it has a lovely scent nothing compares to Charlie Blue. I don't know what I would do, what I would wear if I couldn't find this product. I love Charlie Blue it is my scent and people ask me what I am wearing. This is my first order at a great savings. 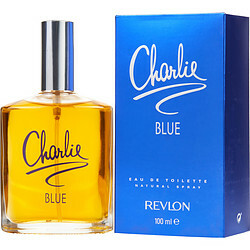 I got the Charlie Blue but Revlon and it stinks. It smells like some kind of old woman's perfume my grandma would wear. The smell of it makes me sick to my stomach. Eww!! Definitely will not order this again. Charlie was the first perfume I got when I was 14 years old. I just loved it. I am now 54 years old and I am still using it every day. It has become part of me, my friends recognize me by it, and up to this day, women keep stopping me to ask what perfume am I wearing because its just lovely; and men.. wow! It drives them crazy! I'm never going to stop using my Charlie. I got a bit confused when they changed the original one which was Charlie by itself and turned it into Charlie Blue..Now there are other ones, but the original is the best! So elegant and femenine. And the price is awesome!.